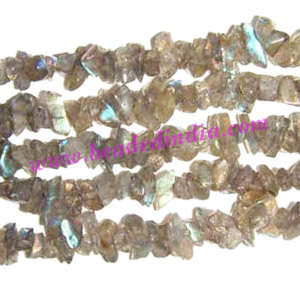 Labradorite uncut chips, semi precious chips, gemstone beads chips, string of 36 inches, low price gemstone chips to make low price jewelry. Leather Cords 6.0mm (six mm) round, regular color - matian green. Silver Plated Brushed Beads, size: 20x20x7mm, weight: 3.86 grams. Silver Plated Fancy Beads, size: 10x16mm, weight: 1.9 grams.